Style. Passion. Intelligence. And that’s even before you turn it on. 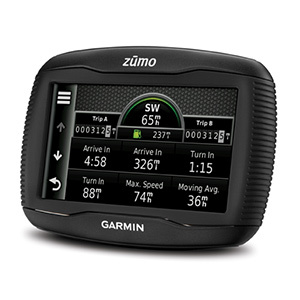 Rugged and waterproof up to 1m¹, zūmo 350LM is built tough for bikers – by bikers. We tested it on rutted-out roads, cobblestone streets, in heavy rain and glaring sunshine and the result was always the same – zūmo kept on navigating. zūmo 350LM features a highly visible, sunlight-readable 4.3” (10.9 cm) touchscreen display with a simple glove-friendly interface. With a Bluetooth™-enabled helmet or headset (sold separately), you can get clear, turn-by-turn spoken directions. 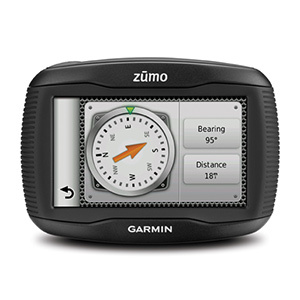 Also included is a motorcycle-specific mount so zūmo rides sturdy, and you ride with confidence. There's even a car mount included for automotive navigation. The new Service History Log lets you record the date, mileage and type of maintenance performed on your motorcycle. Tire mileage, tire changes, tire pressure, chain cleanings, oil changes, new spark plugs – anything you can think of, zūmo will keep a record of it. Use BaseCamp to plan your next ride. You can create routes, waypoints and tracks from your computer and transfer them to your zūmo. The “Track Draw” feature lets you trace your planned route and view elevation changes, helping you estimate the difficulty of your ride. Plan the perfect scenic route, making sure your navigator takes you through your favorite places. Even play back your trips over time and save and share your adventure. 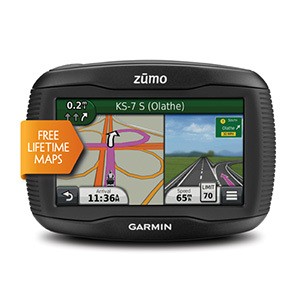 zūmo 350LM offers you the convenience of lifetime map updates², which gives you up-to-date mapping and the most current information about businesses like restaurants, ATMs, hospitals and more. zūmo’s premium navigation search bar returns results for points of interest (POIs) as you type them in giving you a faster, more intuitive experience. There’s also a speed limit indicator and Exit Services that show you parks, gas stations, shops and restaurants for upcoming exits. With TracBack you can ride wherever the road takes you, then navigate along that same route back to where you started.